ICSA president Patrick Kent has said he is alarmed at soundings coming from Brussels that a reduced CAP budget post 2020 could be on the cards. A list of options set out in an EU Commission budget document published earlier today suggested that savings to the overall EU budget to tune of €60bn could be made if the CAP budget was reduced by 15%. This figures rises to €120bn in savings with a 30% cut to CAP spending. 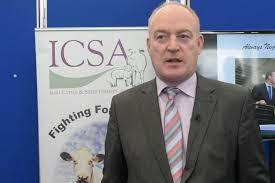 The ICSA Chief said he was horrified that a reduced CAP budget would even be contemplated, given the challenges facing the agriculture sector. Previous PostGovernment gutting local Home Care schemeNext PostNaughton’s says Mammy is ‘continually’ stuck in him over rollout of rural broadband.